The 2018 (High School Girls) Fall Missouri State Cup pool play weekend will be held October 19 - 21, 2018. The semis/finals weekend will be held October 27-28, 2018. 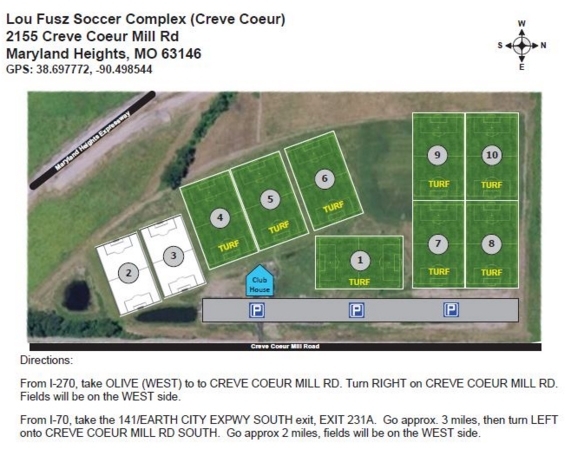 This event will be held at the Lou Fusz Soccer Complex in Maryland Heights, MO. The event is being held on multiple weekends, so as to be more accommodating to the quality of play, team travel, and various tournaments throughout the fall. This event will be for the 15U through 19U girls. STATE CUP RULES are updated annually prior to the start of the competition. Of note, the brackets in 13U & 14U age groups shall not exceed 16 teams total (4 brackets of 4 teams each), 15U & Up age groups shall not exceed 12 teams total (3 brackets of 4 teams and a wildcard shall advance). Should more than the maximum teams apply for an age group, or an odd number of teams apply (other than 2, 3, 4, 8, 12 or 16) then Qualifying Games shall be drawn per the rules linked below to determine those teams that shall advance. approved prior to the event. Sports Forms who are managing our Cup documents. of the field during gameplay. (4 max per team, this includes managers, trainers, directors). This is a “Stay & Play” tournament. Teams participating in the State Cup MUST make all hotel accommodations using PSE Housing. There are no exceptions to this rule. Teams/clubs not using our tournament housing service may be disqualified from advancing in the National Championship Series this year, suspended from future entries in MYSA state events and shall be fined $750 unless our blocks have sold out. To access PSE, Click Here. Hotels rooms have been pre-reserved for out-of-town teams for the second weekend. DO NOT go outside of the housing service to get rooms. Those teams advancing to the second weekend will be contacted on that Monday by PSE Housing.